He's back, and he's sorry. 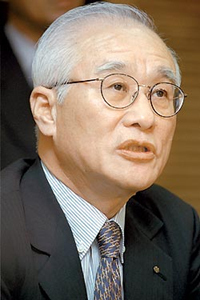 Kim Woo-Choong founded a small textile firm in the mid-1960s and built it into Daewoo Group. The giant conglomerate — or chaebol — was broken up when it went bust owing a spectacular $80bn (£44bn) in the late 1990s. Daewoo remains a global household name six years after its chairman fled South Korea as a wanted man. Daewoo Motors is now under the umbrella of US carmaker General Motors, ensuring the brand lives on, while the shipyards and other businesses have mostly been taken over by their creditors. Now the frail 69-year old has returned from his mysterious wanderings and been arrested. He faces questioning over accounting frauds totalling 41 trillion won ($40bn; £22bn). Police also want to know about $9bn in illegal loans, and allegations that $24.6bn vanished abroad. Mr Kim says he is in poor health and feels the time is right to come home and "take responsibility." But there may also be political reasons for his timing. South Korea's economy is going through a bit of a rough patch. Growth rates are slowing, and the government is desperate to keep good relations with business and promote job creation. Many chaebol bosses have ended up in court on corruption charges, and recently most of them have been amnestied. Some commentators are predicting lenient treatment for Mr Kim, a proposal that angers anti-corruption campaigners like People's Solidarity for Participatory Democracy (PSPD). "The administration will give an amnesty," says the PSPD's director Professor Kim Sang-jo, who is an economist. Populist civil rights lawyer President Roh Moo-hyun's anti-corruption campaign is in "abeyance," says Hank Morris, director of Industrial Research and Consulting in Seoul. "The government is reluctant to crack down on the chaebols at this point." This week, the High Court suspended a three-year jail sentence against another chaebol boss, Chey Tae-won, chief executive of oil importer SK Corp. Although the judges upheld the guilty verdict, they felt jailing Mr Chey conflicted with his "main responsibility, to run his company in future." Top managers from Samsung, Korean Air, and Hyundai Motor have received similarly lenient treatment. GM Daewoo T2X at 2005 Seoul Motor Show. Daewoo Motors has been rescued by General Motors. But why have there been so many spectacular corruption cases involving chaebols? South Korea is often presented as a free-market miracle in contrast to impoverished and communist North Korea. But South Korea's economic miracle - the tiny country rose from the devastation of the Korean war to become the world's eleventh-biggest trading nation - was aided by state patronage. Daewoo, for instance, received soft government loans on its way up, helping it expand by building factories in developing countries to make cheap products for export to richer nations. For South Korea, the result was a favour-swapping culture of illegal bankrolling of political campaigns. 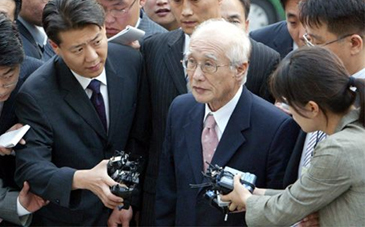 One of South Korea's more bizarre political scandals involved the bankrolling of the summit - seen at the time as a breakthrough for detente - between the two Koreas in 2000 by Hyundai Asan. Its boss later died in an apparent suicide. Local peculiarities in Korean company law also contributed to the wave of dodgy book-keeping scandals at chaebols. Chaebols evolved as a web of sister firms with interlocking shareholdings, rather than units of a single company. The system encouraged them to book sales twice - from one part of the chaebol to another - to overstate their revenues, and made it easy to hide bad debt. Eventually, Korea endured tough IMF reforms after the Asian financial crisis exposed these bad debt flaws. Daewoo Heavy Industries & Machinery (DHI). 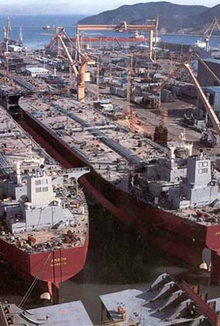 Daewoo once owned shipyards, car factories and electronics factories. Since then, Korea has seen "an enormous move towards global standards and an increase in transparency," says Tami Overby, president of the American Chamber of Commerce in Seoul. Transparency has meant more corruption trials but "what gives us hope is the amount of money involved in these scandals is falling," she says. She believes Korean democracy is robust. Two ex-presidents have been jailed for corruption in less than 20 years since dictatorship ended in 1987. In the past, chaebol leaders were treated, publicly at least, with great reverence, as miracle-working father figures. Mr Kim, for instance, "is thought of as a forerunner of globalisation by many Koreans" because of Daewoo's ultimately disastrous string of overseas factories, explains PSPD's Prof Kim. Whether his return is a sign of a strong democracy or a weak economy, Mr Kim retains his reputation for financial wizardry as many Koreans believe he has wealth tucked away and some even hope he might start investing again. "As a matter of law Mr Kim has no assets but as a matter of reality many Koreans think that Mr Kim has many assets," he adds.